Insurance Exchange Bill on “Hold” Pending Supreme Court Action – OK Senate Changes Mind on SB 1629?? SB 1629 would have established the “Health Insurance Private Marketplace Network Trust”, governed by an appointed Board, that would administer a premium assistance plan (low income insurance, Medicaid), and assist small businesses and/or employees to purchase employer-sponsored insurance. In other words, a state-based insurance exchange, tying users of Medicaid and private insurance together; a sort of public/private partnership exchange. But, those phone calls, emails, in-person lobbying, and robo calls, all objecting to an insurance exchange (state-based or otherwise), paid off. One bad bill has been stopped. Score one for the people of Oklahoma! However, in politics, there is always a Plan B. What Oklahomans can expect is some other tactic being used to achieve the same end – the establishment of some sort of web-based insurance exchange in the state of Oklahoma, that will tie into the health information exchange, which is being advanced by the Oklahoma Health Information Exchange Trust (or OHIET), unstopped. Below is the text of the 3/8/12 Press Release, issued jointly by Senate and House leadership. The Legislature will wait until after the U.S. Supreme Court rules on the constitutionality of the federal health care law before proceeding with Senate Bill 1629, legislators announced Thursday. The U.S. Supreme Court is expected to rule this summer, perhaps as early as June, on a legal challenge brought by several states alleging the federal Patient Protection and Affordable Care Act is unconstitutional. Should the high court overturn the law, the possibility exists that health insurance exchanges would not be necessary. And should the high court uphold the federal law, nuances within the majority opinion could help legislators craft the most effective Oklahoma-based marketplace possible to defend against the imposition of a federal exchange. Given these dynamics, legislative leaders and the chairmen of the Joint Committee of Federal Health Care Law have opted to wait until the outcome of the Supreme Court proceedings before moving further forward with SB 1629. If the court upholds the law, the Legislature is already prepared to continue defending against federal intervention into the Oklahoma health care market. “There are many common-sense solutions conservatives can agree on to lower the cost of healthcare, expand access and choices to more individuals, and increase the quality of our care – all through tried-and-true principles of the free market,” said Sen. Gary Stanislawski, R-Tulsa, co-chairman of the Joint Committee on Federal Health Care Law. “These are ideas worth pursuing, and we eagerly await the Supreme Court’s repeal of ObamaCare so we can begin the very serious business of addressing our healthcare challenges with solutions that expand freedom instead of government,” Stanislawski said. The Joint Committee on Federal Health Care Law met five times throughout the interim to determine the effect the law will have on Oklahoma. Among its recommendations was to craft a state-based marketplace in order to prevent the federal government from imposing a federal exchange in Oklahoma. Legislative leaders supported the committee co-chairmen’s decision. This is the section of law last year’s HB 2130 was attempting to amend. This will bear watching for the rest of this session. OK-SAFE, Inc. – After almost a two month delay, the Joint Legislative Committee on Federal Health Care Reform has finally released it’s final report, 3 weeks after the start of OK legislative session. The Governor and Leadership had seen the committee report much earlier, and legislation implementing the committee’s findings has already been planned and reserved. The Legislature’s February 22, 2012 press release contained no big surprises, especially for those who have been following this state’s years-long implementation of health care reform, via both the HITECH Act of 2009 and PPACA (“Obama Care”). There was no real surprise either, when yesterday (2/21/12) it was confirmed that SB 1116, a bill to repeal the title of law that created the Oklahoma Health Information Exchange Trust (OHIET), would not get a hearing in the Senate. The Senate Leadership, and it’s author Sen. Brian Crain, made sure the bill would not get heard. “The committee’s final report (attached) recommends that Oklahoma: Continue to fight the federal health care law in court; better educate the public about ways to improve their health; prepare for a dramatic expansion of Medicaid eligibility due to PPACA; begin developing a market-based state health insurance exchange in order to prevent imposition of a federal exchange in Oklahoma; form a permanent legislative committee to monitor issues related to the federal health care law; and increase medical residency programs in order to address current and future doctor shortages – particularly in rural areas. What the committee is not mentioning here is the fact the work to align Oklahoma with all the technology provisions of both the HITECH Act of 2009, and the PPACA, has already been started, facilitated by legislation creating electronic health records, and by the creation of a public trust called the Oklahoma Health Information Exchange Trust, or OHIET. If the state builds an exchange, it may say OKLAHOMA (Insure Oklahoma) on the outside, but the inside functionality, and IT standards, will be all federally compliant and interoperable. Besides pointing out the clear contradiction in the statement “state-based, free market health insurance exchange”, (you can’t have both state involvement AND be free-market), this release just confirms the state of Oklahoma, under Republican leadership, is ready to implement a federally compliant exchange, while giving the appearance of fighting “Obama Care”. The OHIET is a public-beneficiary trust that was created by stealth in the last week of May 2010. It is responsible for the implementation of the technology infrastructure in this state that makes “Obama Care” work, establishing the ‘network of networks’ linking the patient (that’s you), the providers, and the payers. The OHIET operates with no legislative oversight, and as the State Designated Entity (SDE), they can solicit and receive federal grants, award contracts, issue bonds, and incur debt. In fact, due to timeline extensions by the HHS they could end up soliciting the very same $54M Early Innovator Grant that Gov. Fallin “rejected” in the spring of 2011. The OHIET is currently using federal grant money to operate (see the Challenge Grant), and are busy awarding each other contracts for health information exchange. The OHIET trust model was drafted by the law firm Crowe and Dunlevy. One assumes that this same firm has had a hand in drafting the proposed insurance exchange trust language, transforming Insure Oklahoma into an insurance exchange. It’s an election year – time to flip some Houses. Both Committee Chairs – Sen. Gary Stanislawski and Rep. Glen Mulready have indicated they would not have supported SB 1116, saying they prefer a patient “opt-in/out” option. This, of course, would leave the OHIET, and it’s agenda, intact. February 22, 2012 Press Release in it’s entirety is available here. The Final Report of the Joint Committee on Health Care Law is available here. Formed at the conclusion of the last legislative session to examine the impact of the federal health care reform law on Oklahoma, this committee held its’ fifth (and final) meeting on Tuesday, 11/15/11 in the House chambers. Video of the meetings is posted on the OK House website. Q. 1 ) Do you think the Oklahoma Legislature should ignore the federal requirement that a health care exchange be established? If so, why? Yes, we think the Oklahoma Legislature should ignore the federal requirements for an exchange. While we can appreciate the complexity of the health care issue in general, we believe that the main problem with this committee’s efforts was the fact that health care reform was not defined to begin with. Health care reform is actually about the development of the IT (information technology) framework that establishes a Nationwide Health Information Network, the creation of an electronic health record on everyone, the flow of highly personal information across jurisdictions, and government access to everyone’s health and medical records. What this “hub” does is allow the federal government access to any and all information a state may have on it’s citizens, including their health and medical records. The state of Oklahoma is progressively developing the infrastructure necessary to help facilitate this federal data hub, sometimes referred to a “globally integrated and networked intelligence enterprise”. Q. 2) What about the provision that provides if a state doesn’t establish an exchange, the feds will do it for them? The state of Oklahoma has been establishing “health care reform” for a while now, and in 2010 established a public-beneficiary public trust called the Oklahoma Health Information Exchange Trust (OHIET). (SB 1373 in 2010). This trust is establishing the ‘network of networks’ that allow for the seamless flow of electronic health records (including medical records) throughout the state, and elsewhere. The OHIET’s purpose is to establish the framework for health information exchange , to establish a ‘network of networks’ and to link providers, payers and patients. According the OHIET’s Cooperative Agreement with the Office of the National Coordinator (the feds), the OHIET plans to align the state’s health information exchange(s) with the federal requirements. Because the OHIET trust has been actively implementing the technological infrastructure necessary for “ObamaCare” to function in this state, it doesn’t matter if the state establishes a state-based health insurance exchange or lets the federal government establish it for us. The functionality of a state-based insurance exchange will be the same as the federal governments exchange and it will be linked to the health information exchanges. 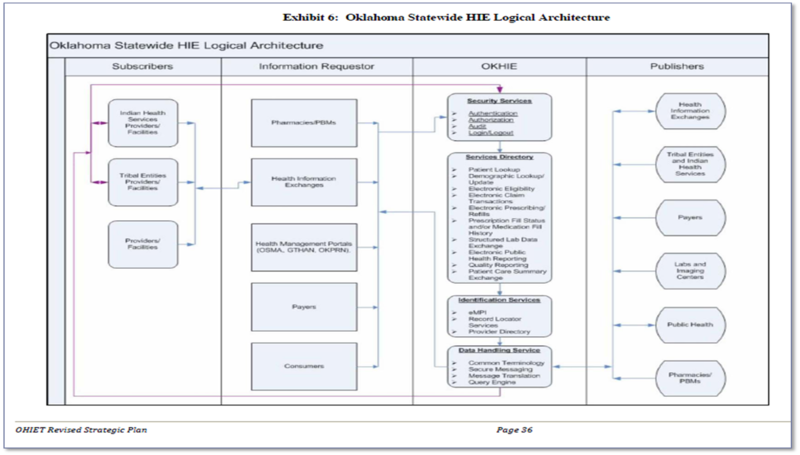 The OHIET HIE logic model. Do we really want this system in Oklahoma? Do we want to make it easier for the feds to access our health records? Q. 3) Do you think the state should count on the health care law being overturned/dismantled by a the Supreme Court or a future administration? Because of the OHIETs activities and other agencies’ activities, it won’t really matter if the Court finds the individual mandate unconstitutional. The technological framework establishing the two exchanges – the health information and the health insurance exchange – and linking to the Nationwide Health Information Network, is moving forward. The only differences allowed in a state-based insurance exchange would be those differences that don’t make a difference. For instance, the state has some flexibility in defining who the Navigators will be and the role they’ll play, and whether the exchange website portal functions like Expedia or not. All of the technological standards, interoperability and information sharing requirements, as well as government and third party access to records, will be aligned with the federal governments requirements. Q. 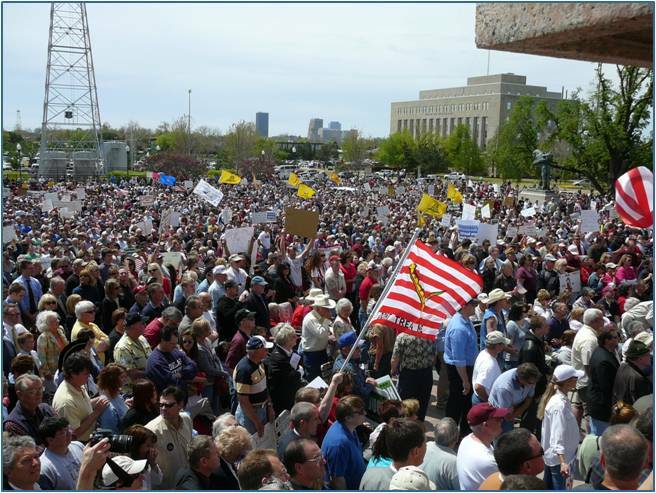 4) What are your thoughts about the ability of the tea party and other grassroots conservative groups like yours to successfully fight against the establishment of the exchanges and to resist the implementation of the federal health care law in Oklahoma? While we’re not speaking for all the grassroots groups in Oklahoma, we think the state should not establish a health insurance exchange. It’s contrary to what the people of Oklahoma want, and we already voted against it (at least, we thought we did). Politically, it would be better to let the feds take all the blame for what is going to happen. Any legislator who decides to move forward with an exchange – whether a state-based non-profit, a for-profit, or a hybrid – is going to be forever linked to it. Next year is an election year – it is my understanding that the citizens of Oklahoma will be making an issue of the health insurance exchanges. Q. 5) What are your thoughts in general about this task force and the work they’ve conducted, recommendations they should make? In general, the committee chairs leaned toward speakers that favored the establishment of a state-based insurance exchange and who advocated for following the requirements of ARRA and PPACA. Other than two speakers from OCPA, OK-SAFE was about the only other “conservative” organization featured. OK-SAFE Recommendations: Don’t build a state-based exchange in any format. Allow providers, payers and patient an escape route – they should not have to play (or pay) into this “network of networks”; let them function outside any and all exchanges without penalty. Further recommendation: Terminate the OHIET trust and audit the OHCA. *It is not known when, or if, these responses will used by the AP reporter, who sent his request on 11/15/11. In the meantime, write your legislator and tell them we still mean NO to “Obamacare” – and this includes the exchanges. OK-SAFE, Inc. – The fifth and final meeting of the joint legislative committee to examine the effects of the federal health care reform law (Affordable Care Act, aka “ObamaCare”, etc.) on Oklahoma will be held in the House Chambers on Tuesday, November 15, 2011. Every Oklahoman with concerns about the implementation of health insurance exchanges (now “marketplaces”), electronic health records (EHRs) being shared everywhere, or infringements on your medical privacy needs to attend these meetings. The meeting, which runs from 9 am to 12 pm, is open to the public and will be streamed online and taped. The agenda for the final meeting is below. MEETING TIME: 9:00 A.M – 12:00 P.M. LOCATION: House Chamber, State Capitol Building. Committee co-chairs are Sen. Gary Stanislawski and Rep. Glen Mulready. Contact Senator Gary Stanislawski’s or Rep. Glen Mulready’s office to express your objections to the creation of a state-based exchange (either kind), and the linking of our medicalhealth records to a “federal data hub”. To call these legislators, see their contact information here. Click on Legislators link, then Senate of House members pages. Video of three of the four other meetings is available on the House website here and on the http://www.okhealthcare.info website, which also has the speakers’ presentations. Audio of the 10/26/11 meeting is available – it takes a while to download. The Solicitor General’s comments about the OK lawsuit, the ballot initiative and ‘opt out’ are heard in the first 20 minutes. The fourth meeting featured seven speakers, including Amanda Teegarden, Executive Director of OK-SAFE, Inc., presenting Health Care Reform – IT, Privacy and Security Issues. This ppt is available on the OK-SAFE website; the video of this presentation is viewable on the 11/3/11 House video beginning at minute marker 00:56:00. OK-SAFE to speak at 4th Meeting on Health Care Reform Law – 11-3-11 Tulsa Tech. Ctr. LOCATION: Tulsa Technology Center, Riverside Campus, 801 E. 91st St., Tulsa, Oklahoma. 2. 10:00 – 10:45 AM, Technology and privacy issues with exchanges – Amanda Teegarden, Executive Director, OK-SAFE, Inc.
Lori Block, Staff Attorney Darrell D. Washington, Admin. Asst. OK-SAFE, Inc. – The third meeting of the joint legislative committee to examine the effects of the federal health care reform law (Affordable Care Act, aka “ObamaCare”, etc.) on Oklahoma will be held in the Senate Chambers at the Capitol on Wednesday, October 26, 2011. The meeting will run from 9 am to approx. 4 pm and should be available for viewing online. The third meeting features speakers addressing the impact on Indian Health; status of lawsuits, and the ballot question opposing the mandate; federal vs. state exchanges; constitutional issues; what other states are doing. 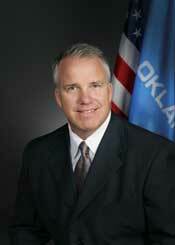 Contact Senator Gary Stanislawski’s or Rep. Glen Mulready’s office to be notified of meetings. The agenda for the third meeting in OKC is below, including the names of the joint committee members. This meeting will be held in the Senate Chambers and audio/visual should be available online. There OK legislature has created a website detailing these meetings: http://www.okhealthcare.info – check for meeting details, including presentations. NOTE: The second meeting took place on October 5, 2011 at the Tulsa Technology Center, Riverside Campus, and featured speakers from the OK Insurance Dept., providers, and insurance underwriters. One presenter, Janet Trautwein, of NAHU, hinted at the development of the federal data hub. Video of this event is here. OK-SAFE, 6/6/11 – The substitute language for the failed HB 2130 (HUB board bill, establishing governance of the health insurance exchange) finally appeared in SB 971, introduced on 4/27/11. Due to all the calls, emails and legislative visits by the Oklahoma grassroots, OK leadership decided not to hear SB 971, choosing instead to form a special joint legislative committee to study the issue this fall. “OKLAHOMA CITY – Two Tulsa lawmakers have been chosen to deal with one of the hottest of political hot potatoes next fall. Sen. Gary Stanislawski, R-Tulsa, and Rep. Glen Mulready, R-Tulsa, are the leaders of a special joint legislative committee that will study how the state should respond to the federal mandate to create a state health insurance exchange.” Rest here. These public meetings should be attended by everyone with concerns about the controversial health care reform act.